I was speaking to a large audience of students, at one point explaining my writing process for an upcoming SCARY TALES book, titled The One-Eyed Doll. The first image that came to me was the discovery of a door, or a hatch, in a bedroom floor. An old rug had been pulled away and there it was. Strangely, the door was padlocked. That image got me thinking. Why the lock? Over time, I played around with the idea, moving the hidden door to a basement and, later, to the woods, obscured below the leaves. It evolved into a locked box buried behind an abandoned house and discovered by three children. By the way, I love the idea of characters believing they found something — that they acted upon an object — when the truth is the exact reverse: the object had acted upon them. So: What was inside the box? Why was it locked inside a box, nailed shut, padlocked, and buried? 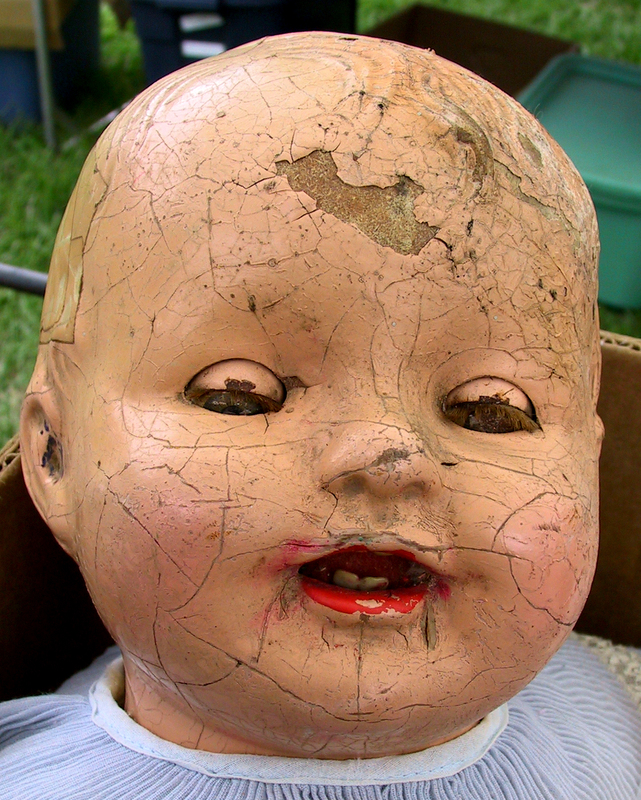 Well, there must have been something strange about that doll. Right? We all know that. Every kid knows it, too. This isn’t our first rodeo. 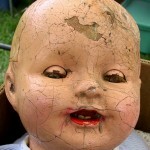 Now as the writer of this story, I had not yet figured out the issues surrounding this doll. The whys and wherefores. I had not yet answered the essential question a writer must answer for every character, in every story: What does this doll want? Well, yes, I guess. Like Chuckie. There are not many original ideas left. So, sure, absolutely, the evil doll is like Chuckie, though I’ve never watched those movies. Chuckie, of course, is not the original evil doll. Twilight Zone had several, the old Bat-Man comics — often a ventriloquist figures into these things — and so on. It’s a familiar conceit, a cousin to the Gingerbread Man and even Pinocchio. This is not depressing to me, as a writer. It’s inspiring. Likewise, the secret door has been done a million times, most notably in Lewis Carroll’s Through the Looking Glass, C.S. Lewis’s “Narnia” books, and just about every time-travel novel ever written. Stephen King used a storage closet for his “secret door” in the terrific novel, 11/22/63. The door is just a device that gets you to the other world — or get the reader (and writer) to the story. Just push on through and don’t worry too much about how that door got there in the first place. On and on it goes. We stand on the shoulders of giants. Now it is fair to ask: If you can’t come up with your own ideas, why bother? And I’m here to say that is exactly the wrong way of looking at it. Because I am talking today about tradition, ladies and gentlemen, specifically about writing within a tradition — an awareness, conscious or not, that we’ve inherited a rich past. All those stories mining the same turf. Every storyteller throughout history with a pick axe and calloused hands. It’s not copying. It’s creating a new thing using familiar elements. In that respect, it’s a lot like cooking. Here’s a chicken, here’s an oven, here’s some herbs and spices and all the vegetables ever invented. 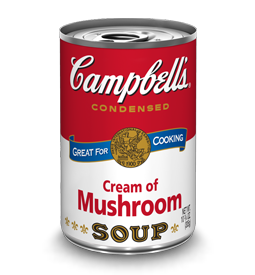 And, sure, if you are like my mother, here’s a frying pan and a can of Campbell’s Cream of Mushroom Soup. The challenge is to cook up something new. 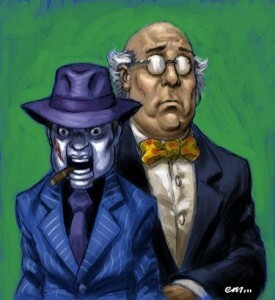 I experienced this same thing when writing the Jigsaw Jones mystery series. That same sense of jumping into a river, pushed on by the current. And then, treading water, I start to move my arms, kick my feet for fear of drowning. The water of tradition — Chandler and Hamitt, Connelly and Sandford, Sobel and Christie — whomever! — carrying me along (so long as I kept swimming). Did I ultimately make something new? I can’t be the one to say, but I’ve sure enjoyed getting wet.